Saturday was a mixed day in Kentucky and one which reminds you of the highs and lows of our sport. Seacookie started the day brilliantly. First on course he jumped a super round to finish inside the time. He felt fantatsic, definately back to his best and gave me a great ride. It was then a long wait before it was Chilli's turn later in the afternoon.There was a fair amount of trouble on the course throughout the day, quite evenly spread but I was looking forward to it and set off feeling very positive. However sadly, after a refusal at the first water I decided to reture Chilli. He wasn't on a going day, we don't know why or what reason but he will come home safe for another day. It is always hugely disappointing when something like this happens and I am gutted for my team at home and his owners Chris and Lisa Stone, but that is horses. 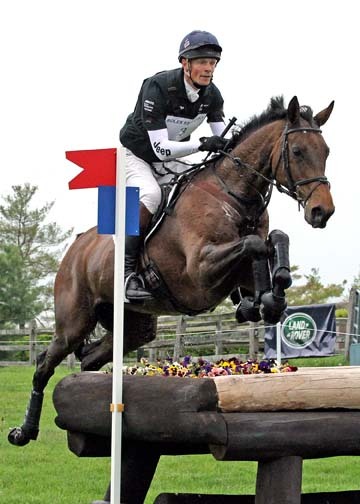 Seacookie finished the day in 4th, just two fences behind the overnight leaders so there is still plenty to play for. He will trot up this morning (Sunday) at 08.30 (13.30 UK time). Show juming starts at 13.15 (18.15 UK time) so jumping in reverse order, he will be between 14.30 & 15.00 (19.30-20.00 UK time). You can watch all the action live at www.feitv.org and you can see the full results by clicking here. Watch William and Seacookie on course yesterday by clicking here. William & Seacookie on course at Rolex yesterday. Thanks to Julia Shearwood for this shot.